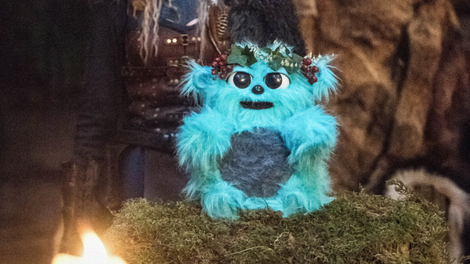 "Beebo The God Of War"
DC’s Legends Of Tomorrow just killed off one of its main characters, but rather than wallowing in misery, the show goes in the opposite direction with “Beebo The God Of War.” Cuddle Me Beebo was the hot holiday toy of 1992, but when a young Martin Stein is teleported back in time with the fuzzy blue critter, Beebo becomes a new god for Leif Erikson and his band of Vikings that arrived in North America a millennium ago. The cold open for this episode does excellent work setting the tone, and a rollicking Hanukkah tune underscores Martin’s rush to the toy store cashier with Beebo in hand. The energy builds until the scene is abruptly cut off by Martin getting thrown into the past, and that blend of excitement and humor drives the episode. The Vikings take over all of North America to satisfy Beebo’s insatiable hunger because he’s programmed to say he’s hungry when squeezed, and Christmas becomes Beebo Day thanks to this latest anachronism. Legends has gone to some very silly places in the last two seasons, but it’s going to be hard to top a story about a Furby/Tickle Me Elmo hybrid that compels the Vikings to turn North America into New Valhalla. The adorable design of Beebo makes him especially out of place in the hard environment of the Viking camp, and his limited dialogue is a regular source of comedy, particularly during the big action sequence that has the Legends trying to get Beebo away from his worshippers. “Beebo likes to play!” The toy says as Nate runs through a swarm of attackers, and while Beebo meets his end halfway through the episode, he makes a glorious return thanks to Ray, who gives him some hilarious new lines to make the Vikings believe in Jesus and science. I’ve grown tired of Damien Darhk as a primary antagonist, but this episode finds a fun angle for the character by having him pose as Odin and doing some cool lightning tricks to convince the Vikings to worship him. 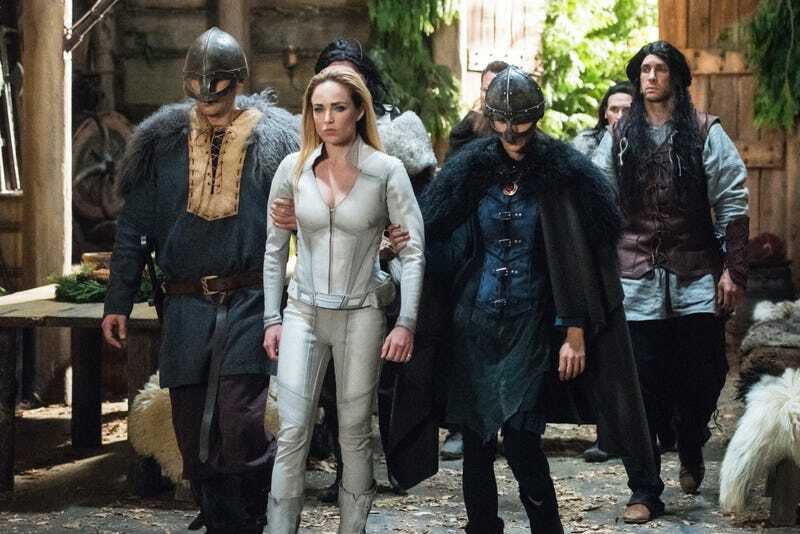 Darhk replaces Beebo after the toy is burnt to a crisp by Mick, and the show takes a creative approach to set up the Legends’ fight against their frequent foe. Sara wants the team to leave her behind because she doesn’t want to lose another friend, but her plan won’t work without other heroes. As Sara explains her plan, the scene jumps to show her in action and quickly getting her neck snapped. We then see her team’s plan in action, and while it doesn’t have the desired conclusion when it’s implemented in real life—Darhk doesn’t end up with an arrow in his chest—it does save Sara from being killed. After spending the first episodes of the season as a thorn in Sara’s side, Agent Sharpe is stepping into an ally role as she helps the Legends with their current mission. The Time Bureau is in a state of disarray after putting Rip in prison, and Sharpe can do more good working with the Legends rather than staying stuck behind bureaucratic red tape. Sara and Sharpe still haven’t hooked up yet, but it is definitely coming because there is some serious flirting going on in this episode. Sara ends up in an alternate dimension and feels the absence of love and warmth that is Mallus for the first time, and Sharpe is there to offer some comfort afterward, committing to continue helping the Legends keep this otherworldly presence from gaining power. I don’t know how long Wentworth Miller is sticking around Legends during his farewell tour of the Arrowverse, but it sure is nice to have him back. I love that both Miller and Dominic Purcell have no interest in realism, and they’re characters work well together because both performances are so exaggerated. They fully embody the extremes of their characters: Miller is cool and smooth, Purcell is hot-headed and gruff. They have established chemistry thanks to their time playing brothers on Prison Break, and that rapport intensifies the bond between Leo and Snart, who both wish they were with their respective Earth’s version of the other. Leo tries to get Mick to realize he has a drinking problem in this episode’s C-plot, and while Mick probably is an alcoholic, this thread ends with Leo realizing that Mick will never be Mickey and he shouldn’t try to change him. This episode does make time for necessary scenes of characters grieving Martin Stein’s death, but even that element of the plot is lighthearted thanks to Leo Snart and his therapeutic Martin puppet. This is a totally ridiculous sequence, but I appreciate that the show doesn’t immediately get grim as it deals with the emotional fallout of Martin’s sacrifice. It was inevitable that there would be a plotline where time travel is used to prevent Martin’s death, and the show doesn’t make us wait for that story. Reuniting with young Martin gives Jax an opportunity to try and change the course of events, and even though Sara tells him not to interfere, Zari convinces him to take action. If she had a chance to save her brother she would take it, orders be damned, and it’s nice to see that Zari’s rebellious spirit hasn’t disappeared now that she’s a team player. Jax gives young Martin a note that is not to be opened until November 28, 2017, but Martin is really smart and knows what’s going on here. He didn’t see his older self on the Waverider, and given that he’ll be 67 on the date he’s supposed to read that note, he figures he’s probably dead. Martin refuses to cheat death, and he echoes a lot of what his older self said regarding the full life he’ll live and how he wants Jax to experience that fulfillment rather than being haunted by a ghost. Jax realizes that he’ll never be able to get over Martin’s death if he stays on the Waverider, and the team throws him a goodbye holiday celebration to wish him on his way. This scene highlights the family dynamic of this group, and all of these broken people have come together to make each other whole. It’s a very sweet way to end a great year for this series, and I expect Jax won’t be on his own for long before he realizes he wants to get back to the people he cares about most. John Constantine appears at the end of this episode to ask for Sara’s help stopping a demon that has possessed a little girl, but we’re going to have to wait two months for Legends’ riff on The Exorcist when it returns in February. Grodd went back in time and destroyed the Great Wall of China! I love that this episode casually tosses in that information. The Legends’ viking costumes are very evocative, but my favorite thing about their looks are the hairstyles, particularly for Nate and Ray. They look like goofballs, but that’s a big part of the charm. Jax plays as Jax in Mortal Kombat. This moment got a good chuckle out of me. “Wah wah Beebo love you.” I would like even more of Sara imitating Beebo, but I generally want more of Sara doing everything. “Beebo want cuddle.” Such tragic last words.